I am sorry to say that the men's department is a little weak at the moment. I do hope to add a few more items as I come across them.If you are looking for anything in particular, please let me know. I'd be happy to keep my eyes open for you - particularly if it was manufactured by Pendleton Wool Mills or White Stag. This is their country here in the Portland, Oregon area. Men's Clothing There are 9 products. Great Pendleton Woolen Mills Topster wool jacket from the 1950's. Similar to the 49er for women, this unlined jacket is for men. Quality 100% wool fabric. Red and green tartan plaid color. Has a nice sporty look when worn with a shirt and tie. Or, more casual looking when worn as a shirt. 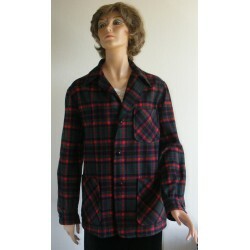 Quality made, vintage 50's men's wool jacket / shirt from Pendleton. 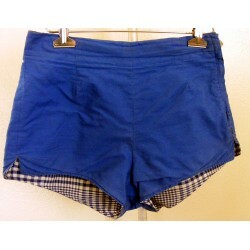 Hawaiian mens swim trunks from the 1980s can also be worn as shorts. Pacific Isle Creations of Hawaii. Big, bold hibiscus flower print - red, pink, white, brown and gold colors. Has a small, flap covered pocket in the back. Elastic and drawstring waist. Fully lined and has polyester knit supporter. A nice pair of Hawaiian swim trunks from Pacific Isle. Swim trunks and swimwear from Jantzen. 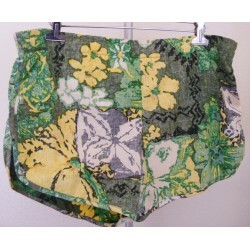 Hawaiian floral print of green, yellow, black and white. These trunks are fully lined. Has an elastic waistband with string tie. Also, has a small, interior pocket for a key or coins. 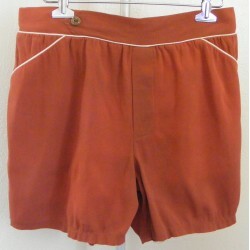 Vintage, 1980's pair of shorts from Jantzen to wear to the beach, lake or just running around in. 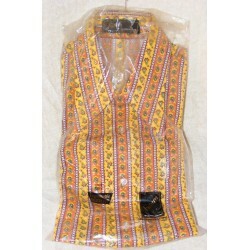 Brown and yellow with a hint of green and white, comes this crazy men's shirt from Van Heusen - Futura. It has short sleeves and has never been used. Still in it's original plastic package and cardboard insert at the neck. 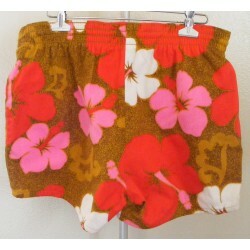 Men's swimwear or shorts, Cheeters by Surf Line of Hawaii. Bright, bold and colorful print of flowers and geometric design. Brown, gold, green, orange, white, purple and red colors. Fully lined with purple cotton fabric. Drawstring at the waist. A bold, fun pair of men's swimwear or shorts. Mens swimwear and trunks. Blue reversible with one side blue and white checkered. The other side is solid blue. 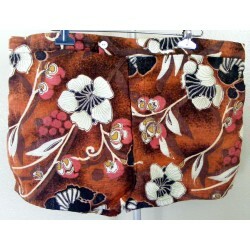 Metal, side zipper with white shell button closure. Tag says the fabric is from Europe. Partial elastic in the waistband at the back. 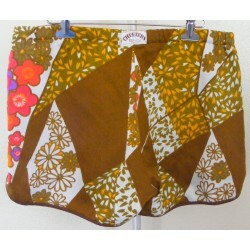 This is a nice pair of vintage shorts or trunks for swimming.